Dan Peek, a founding member of the popular 1970s band America and singer of high harmonies on hits that included A Horse With No Name and Ventura Highway, has died, his father said. He was 60. Peek's wife, Catherine, found him dead on Sunday in bed in his home in Missouri, south west of St Louis, Milton Peek said. The cause of death was not known, and a post-mortem was planned. Dan Peek suffered from arthritis, but it was not known if that was a contributing factor. Peek, whose father was in the US Air Force, had met the two other members of America - Dewey Bunnell and Gerry Beckley - while attending college in London. After signing a record contract, America were an almost instant sensation with songs featuring tight harmonies over catchy tunes. All told, America had three platinum and three gold albums, along with eight Top 40 hits, from 1971 through to 1975. 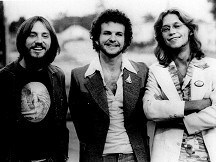 The group's first album in 1971 included the number one hit Horse With No Name. Other hits followed - Tin Man, Sister Golden Hair, and Daisy Jane, among them. Peek played lead guitar on many of the songs, and wrote some of them, including the 1974 hit Lonely People.